The behavior of granular systems is determined by the interaction between its constituting particles. 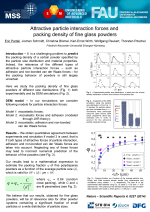 Detailed insights in the particle interaction are essential for truly understanding the properties of granular matter, as well as for modeling and simulating granular systems. Dynamic collisions and static contacts between particles are both characterized by interaction forces. One aim of this project is to obtain sufficiently realistic and yet efficient expressions for these interaction forces. Such expressions are the basis for high quality force-based particle simulations of granular systems. Another paradigm is to describe the contact between particles by effective collision-rules rather than forces. One of these collision-rules is based on the concept of the coefficients of restitution. This concept is the foundation of both, highly efficient event-driven molecular dynamics for the simulation of granular systems as well as kinetic theory of granular matter based on the Boltzmann equation. This project involves high precision measurements of the coefficients of restitution as well as theoretical works to improve and extend the underlying concept. Moreover, this project is devoted to pushing the boundaries of event-driven simulation and kinetic theory. Current research is focused on the collision of complex-shaped particles, nano-particles and on impact phenomena where the inner degrees of freedom of the colliding objects are explicitly relevant.